I’ve been swamped the past two weeks, hence the delay in the rankings. I did have a huge realignment post lined up, but then Texas tried to play chicken with the Pac-12 and lost. As of now everyone is back to a holding pattern. 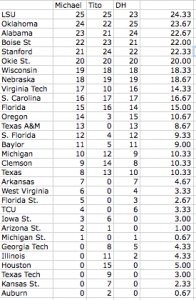 The SEC and Big East have to move (the SEC to get to 14 and the Big East at least to return to the BCS-minimum 8). Who knows what will happen? Thankfully, there is real football. Oklahoma, Alabama, and LSU have already established themselves as national title contenders. Wisconsin with a win over Nebraska could put themselves into that category this week. We’ll see how Clemson & Va Tech pan out but the winner will likely win the ACC and be the conference’s best hope for a national title. In the PAC-12, we’re still waiting on stanford v. Oregon to see who will be the top dog, but Arizona St. is making a good case to win the South and play the spoiler role come December. With S. Florida’s loss last night, it looks like the Big East is just going to be grateful to get its last (or second to last; no one’s said when Pitt & Syracuse are leaving) BCS invite this year. The Heisman is still a mess, though I note that despite the love LSU’s defense has gotten its star Tyrann Mathieu gets no Heisman love. I understand QBs are shiny, but at some point doesn’t a D guy deserve some real consideration even if he’s not return KOs and INTs like Woodson? If not, let’s have a defensive Heisman and acknowledge that the Heisman is really an offense-only award. As you can see, LSU gets two top votes with Oklahoma getting one. LSU’s definitely got the resume, but Oklahoma does have some fearsome weapons. Bama is up there with a big win over Arkansas, but I’m curious how their offense fares this weekend. Specifically, are they more than Trent Richardson? After this week, we’ll have out first real good idea of where everybody is as the last teams emerge from cupcake land and play real competition. The Big East is doomed as a football conference, as it should be. I am a longtime Pitt fan and anyone could see that the Big East administration saw football as a poor redheaded stepchild to basketball. Well, despite the numerous problems that college sports has, football drives the bus, not basketball. For several years, the administration at Pitt urged the Big East to strengthen its football lineup, but, being based in Providence, they dragged their feet. Central Florida, East Carolina and most notably the University of Houston wanted in the Big East. The Catholic basketball only schools didn’t like the football schools and as a result, Virginia Tech, Boston College and Miami fled back in 2003, and Pitt & Syracuse are now following them. There is no great BE football team, and there usually hasn’t been.